When you can’t think what to wear, it’s so useful having some timeless outfit combinations that always work in your wardrobe. By timeless I don’t mean frumpy, because you can update them each season with a few trend pieces. But these timeless outfit combinations can be worn again and again. You also might want to add new versions of them at the beginning of the season. 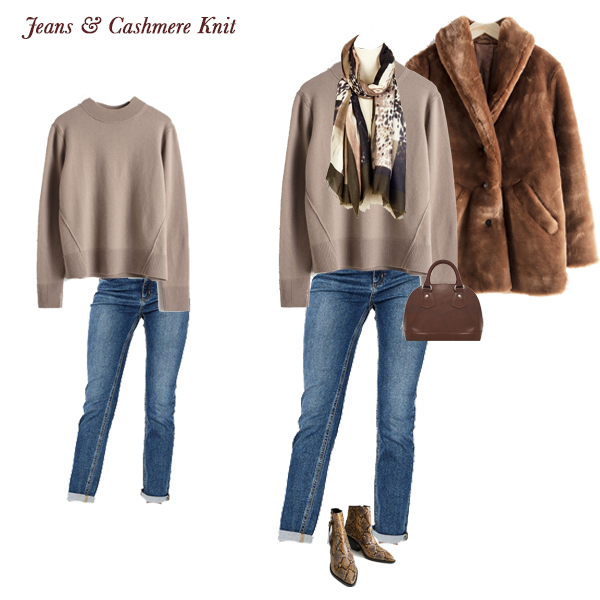 For example, with the cashmere knit and jeans you could add new colours in the knit and different shapes or colours of jeans. You really can’t go wrong with this combination and it’s one that can be worn all four seasons of the year. The trousers might be wool in the winter and a lighter cotton in the summer and the blazer might move from wool in cooler months, through to linen in the warmer months. 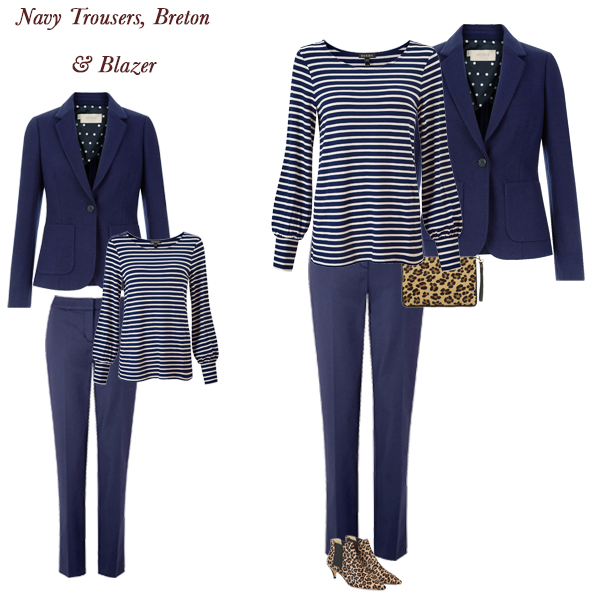 For this season I have chosen a tweed blazer which covers the Heritage trend, a Breton top made modern by its puffed sleeves and the must have leopard accessories. A wrap dress with knee high boots and a biker jacket is an easy combination that would be appropriate for so many occasions. Wear it for relaxed workwear, weekend lunch and even a casual night out. This season there are several key boot trends. 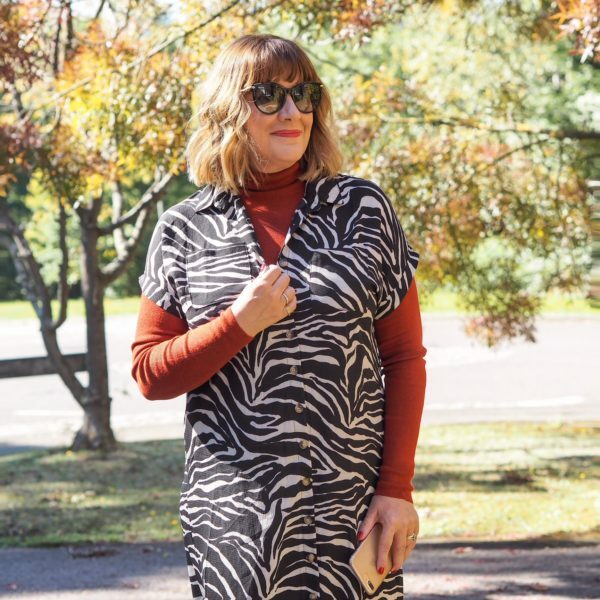 One of them is the slouchy boot and they immediately update this wrap dress. I have swapped the traditional biker jacket for an oversize faux shearling style and added a saddle bag. Jeans are the easiest of all casual wear. But adding a cashmere sweater elevates them with a touch of luxury. Again this is a multi season combination, just choose a featherweight cashmere when it’s warmer. To give this combination a new season spin I have added a few of the key trend pieces. A faux fur coat has now almost become a winter staple and here I have chosen one in a tan colour to create the Creme Caramel colour combination that was seen on all the catwalks. The cowboy boot is back and you get extra style points if they are in a snakeskin. I’ve also mixed animal prints by adding a touch in the scarf and finished the outfit with an update bowling bag. Do you have any timeless outfit combinations that you resort to when you have nothing to wear? If you want more gorgeous outfit ideas why not order the Autumn Capsule Wardrobe with 4 weeks worth of outfits in 2 colour ways, just £39. Or if you would like me to create a personalised capsule wardrobe just for you take a lot at my capsule wardrobe services.